On a chair leg’s journey from square to round (for the pedants: from cuboidal to cylindrical) there are several options for marking it out to get to octagonal. I’m a big fan of the spar gauge; they’re handy for any piece that tapers along its length. But for building the occasional chair a dedicated tool may be a bit much. Here’s another way – one that I use a lot even though I have a couple of spar gauges in a draw. Plane the future chair leg square to a hair shy of the final diameter. On one the end of the workpiece mark the centre using the 45 degree fence on your combination square. Draw a circle (or just a quarter of a circle) with a pair of compasses. Mark a tangent using your combination square. Set your marking gauge to the point where the tangent meets the edge. Use this setting to mark the length of the workpiece. Draw a line on all eight sides. Plane a few strokes until your piece is an even 16 sides. No need to gauge anything here – trust your eye and the length of the ever decreasing pencil lines. Scrape with a concave scraper. Or you could use a lathe. David Fisher’s blog post about holdfasts and ratchet straps this afternoon prompted me to put down the plane and pick up the camera to share something I’ve had in my head for a while. Last week was London Craft Week. I missed most of it. Passing a shop on Upper Street I saw the aftermath of a seat weaving demonstration from Danish Modern furniture makers Carl Hansen. The batten across the stretchers is tensioned by a bottle screw. It looks as though this setup is specific to one chair – the Hans Wegner CH23. I don’t make runs of chairs so need more flexible methods. Rather than a bottle screw I use a Truckers’ Dolly. I feel a bit of a fraud holding forth on knots. My dad taught me all the knots I know (and teaches marlinespikery) and he still has a head full of them that I didn’t have the patience to learn. He uses the Truckers’ Dolly for securing loads to his trailers. This varies from tensioning a tarpaulin to holding down a boat. Last year we tied a large, wet, oak log to a trailer with this and it didn’t shift a millimetre for the fifty mile journey. When I was a kid we decided to test the power of it and added several purchases along a length of line. The extra purchase more than compensated for the increased friction and we pulled a small willow stump from the ground. However it’s not designed for dynamic loads; holding static loads securely is its strength. Here I’m using a simplified version. Dad would have a few improvements, I’m sure. He’d want a directional figure of eight rather than that overhand knot on a bight and he’d get at least one more purchase on there. Secure the holdfast to the bench with a firm clout. Tie a round turn and two half hitches to the holdfast. Take the line over the stretcher or batten and put an overhand knot on the bight. Take the line back round the holdfast and up to the bight. Through the bight, pull down hard. The chair will move slightly if it isn’t perfectly aligned over the holdfast. Pull down hard on the purchase and take the line around the whole mess with two half hitches. These will pull it all together tensioning it even more. If you have space you can add more purchase to it with more bights until the friction becomes more of a hindrance than the purchase helps. Leather over the stretcher will help prevent slips and leather on the batten across two stretchers will add some padding. Eight times as bad as antagonising? No. Turning square sections into octagonal sections. How many of us have to use it before it gets a place in the OED? I’m reading The Anarchist’s Design Book at the moment. I’ve read the first four chapters and skimmed the staked furniture projects. 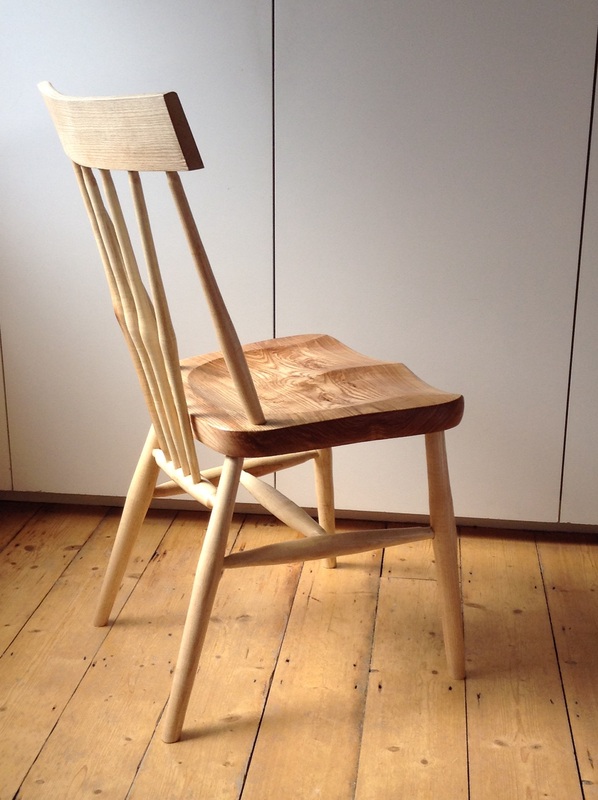 One of Chris Schwarz’s contributions to chair making is finding ways to build them without a box fullof specialist tools. Most of the time this is helpful and appreciated. Rather than creating anarchy it democratises the craft. But sometimes a specialist tool can really help and won’t cost the earth. It’s called a spar maker’s gauge. When building masts, booms, gaffs, lugs, sprits, bowsprits, boomkins or any other pole a boatbuilder often starts with a square section piece of wood, tapers it at either end and then planes or saws the corners off to make it an octagon. It’s then a bit more planing with hollow planes and you’ve got a rounded spar. Hayward’s compass trick wouldn’t work here. There are tapers at both ends and they aren’t uniform. Instead they use this gauge. Building it is a matter of a few minutes work. The gap between the dowels must be slightly larger than the largest diameter of the spar, or in this case, leg. The spacing is critical. It’s better explained here. Last year, when I built a stool for my new workshop, I used it for the legs. Works a treat. You might prefer pencils rather than nails. If you plan to build more than one chair it will be worth it. I spent a week learning to make chairs with a pole lathe this summer. Six lovely days in the woods of Westonbirt arboretum. What could be better? When Harry, who came to fix our Velux windows, saw the result he commented, “One of them old-fashioned chairs with the arse cut out of ’em.